Miami, Florida has a reputation among the birding community for being overrun with exotic bird species. It is well-deserved. 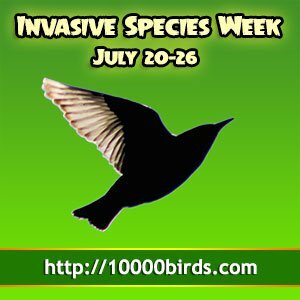 Spot-breasted Oriole, Purple Swamphen, Common Myna, White-winged Parakeet, Red-whiskered Bulbul and Monk Parakeet are the ones that garner the most attention among those interested in listing, since they are ABA-countable. However, the typical birding experience for someone down here also includes a large menagerie of other species such as Orange-winged Parrot, Mitred Parakeet, Egyptian Goose and Nutmeg Mannikin. One of the more unusual additions to our local avifauna is the Common Hill Myna (not to be confused with Common Myna, a parking lot obligate in Miami), a popular bird in the pet trade due to its ability to mimic human speech. Their loud, descending whistles, gurgles and screeches are a common feature of parks and suburban neighborhoods in parts of Miami-Dade. 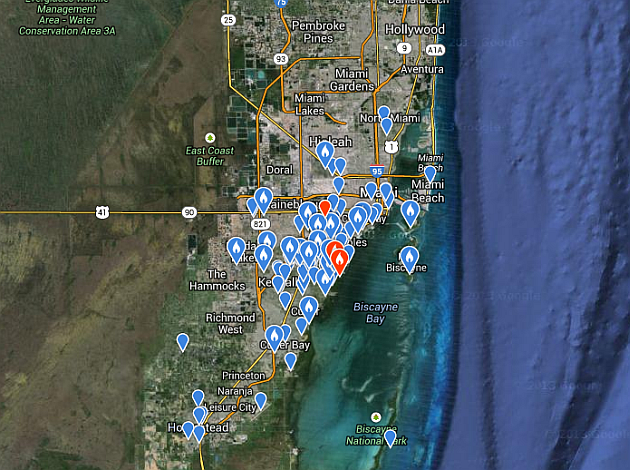 Common Hill Myna’s range in South Florida. Distributed across a broad swath of territory that includes India’s Himalayan foothills, Thailand, Indochina, peninsular Malaysia and western Indonesia, this species occurs in moist or semi-evergreen forests that may include secondary growth and degraded habitats in its native range. It even occurs on small, remote islands in the Andaman Sea which harbor few other native land birds. Despite their apparent adaptability, Common Hill Mynas seem to thrive in a very small, triangular piece of Miami-Dade demarcated by Tamiami Trail to the north, the Florida Turnpike to the west, Cutler Bay to the south and Biscayne Bay to the east. The eBird map above illustrates that it is a relatively common species within its tiny introduced range where it favors tropical hardwood hammocks and lush neighborhoods with relatively old, mature trees that provide cavities for nesting. From experience, these primarily frugivorous birds do show local movements that may depend on the local ripening of fruit outside the breeding season. Common Hill Mynas are easy to locate due to their loud, shrill calls. 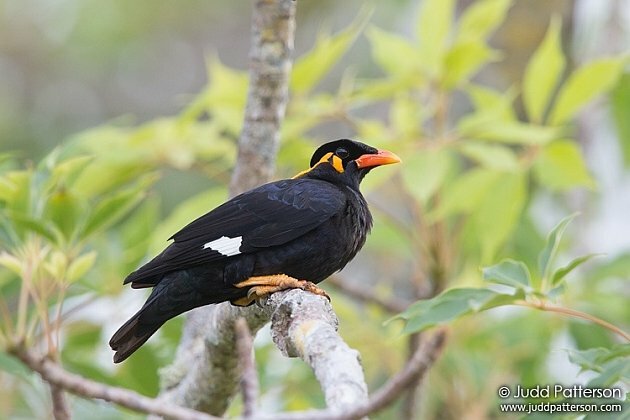 Observers confirmed that Common Hill Mynas were nesting in Miami-Dade in 1973. During the 1986-1991 Florida Breeding Bird Atlas, breeding was confirmed in three quadrangles that more or less reflect its present distribution. 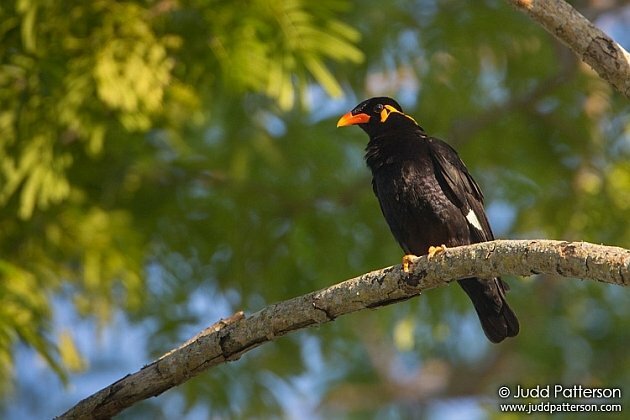 Although its presence predates the arrival of several now countable exotics and it is still successfully nesting in the area, Common Hill Myna seems unable to spread beyond their suburban stronghold. Could it be due to climate? Lack of feeding opportunities? Availability of nesting cavities? No one is really sure. This local oddity seems doomed to dwell in perpetual listing limbo as an innocuous, non-countable species. If you would like to make a trip to southern Florida in search of Caribbean specialties, exotics, or general birding, please visit my webpage at www.ecoavian.com or contact me by email at csanchez1230@gmail.com to inquiry about my guiding services. Images for this week’s blog post are courtesy of Judd Patterson. More of his stunning photography can be seen at www.birdsinfocus.com. A native of southern Florida, Carlos Sanchez has had a fascination with wildlife as far back as he can remember combined with an unquenchable thirst to learn -- the first books he checked out of the library were Beehler's "Birds of New Guinea" and Stiles and Skutch's "Birds of Costa Rica." Despite his parent's belief that he would 'grow out of it,' Carlos's passion has never wavered, and he has dabbled in everything from bird art to taxonomy. His passion has interwoven with his interest in travel, having birded extensively throughout the United States, eastern Australia, Thailand and Ecuador along with shorter jaunts to other locales such as Puerto Rico and Jamaica. In 2013, Carlos was a resident naturalist and birding guide at Cristalino Lodge in Brazil. If you would like to make a trip to southern Florida in search of Caribbean specialties, exotics, or general birding, please visit www.ecoavian.com to inquire about his guiding services. Alien species – Rose-ringed Parakeet.